The U.S. mainstream media are going nuts. They now make up and report stories based on the uncritical acceptance of an algorithm they do not want to understand and which is known to produce fake results. In other words - the "Twitter accounts suspected of having links to Russia" were following the current news just as cable news networks do. When a new sensational event happened they immediately jumped onto it. But the NYT authors go to length to claim that there is some nefarious Russian scheme behind this that uses automated accounts to spread divisive issues. 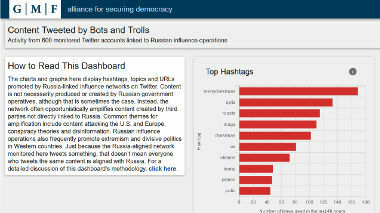 Last year, the Alliance for Securing Democracy, in conjunction with the German Marshall Fund, a public policy research group in Washington, created a website that tracks hundreds of Twitter accounts of human users and suspected bots that they have linked to a Russian influence campaign. ... to publicly document and expose Vladimir Putin’s ongoing efforts to subvert democracy in the United States and Europe. There is no evidence that Vladimir Putin ever made or makes such efforts. The ASD "Hamilton 68" website shows graphics with rankings of "top items" and "trending items" allegedly used by Russian bots or influence agents. There is nothing complicate behind it. It simply tracks the tweets of 600 Twitter users and aggregates the hashtags they use. It does not say which Twitter accounts its algorithms follows. It claims that the 600 were selected by one of three criteria: 1. People who often tweet news that also appears on RT (Russia Today) and Sputnik News, two general news sites sponsored by the Russian government; 2. People who "openly profess to be pro-Russian"; 3. accounts that "appear to use automation" to boost the same themes that people in group 1 and 2 tweet about. Nowhere does the group say how many of the 600 accounts it claims to track belong to which group. Are their 10 assumed bots or 590 in the surveyed 600 accounts? And how please does one "openly profess" to be pro-Russian? We don't know and the ASD won't say. On December 25 2017 the "Russian influence" agents or bots who - according to NYT - want to sow divisiveness and subvert democracy, wished everyone a #MerryChristmas. Russian-linked bots have rallied around other divisive issues, often ones that President Trump has tweeted about. They promoted Twitter hashtags like #boycottnfl, #standforouranthem and #takeaknee after some National Football League players started kneeling during the national anthem to protest racial injustice. Twitter’s internal analysis has thus far found that authentic American accounts, and not Russian imposters or automated bots, are driving #ReleaseTheMemo. There are no preliminary indications that the Twitter activity either driving the hashtag or engaging with it is either predominantly Russian. The same is presumably true for the other hashtags. In recent weeks, I have been keeping a close eye on Hamilton 68. Every time a Dutch hashtag was shown on the website, I made a screenshot. Then I noted what was playing at that moment and I watched the Tweets with this hashtag. Again I could not find any Tweet that seemed to be from a Russian troll. In all cases, the hash tags that Hamilton 68 reported were trending topics in the Netherlands. In all cases there was much to do around the subject of the hashtag in the Netherlands. Many people were angry or shared their opinion on the subject on Twitter. And even if there were a few tweets with Russian connections between them, the effect is zero. Because they do not stand out among the many other, authentic Tweets. Van den Berg lists a dozen examples he analyzed in depth. The anti-Russian Bellingcat group around couch blogger Eliot Higgins is sponsored by the NATO propaganda shop Atlantic Council. It sniffs through open source stuff to blame Russia or Syria wherever possible. Bellingcat was recently a victim of the "Russian bots" - or rather of the ASD website. 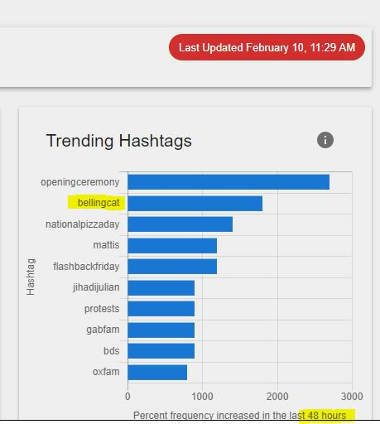 On February 10 the hashtag #bellingcat trended to rank 2 of the dashboard. Bellingcat was thus, according to the Hamilton 68 claims, under assault by hordes of nefarious Russian government sponsored bots. The pro-NATO propaganda shop Bellingcat thus debunked the pro-NATO propaganda shop Alliance for Securing Democracy. The fraudsters who created the Hamilton 68 crap seem to have filled their database with rather normal people from all over the world who's opinions they personally dislike. Those then are the "Russian bots" who spread "Russian influence" and divisiveness. Moreover - what is the value of its information when six normal people out of millions of active Twitter users can push a hashtag with a handful of tweets to the top of the dashboard? But the U.S. media writes long gushing stories about the dashboard and how it somehow shows automated Russian propaganda. They go to length to explain that this shows "Russian influence" and a "Russian" attempt to sow "divisiveness" into people's minds. The import of GMF's project is clear: Reporting on anything that might put the US in a bad light is now tantamount to spreading Russian propaganda. It is now even worse than that. The top ranking of the #merrychristmas hashtag shows that the algorithm does not even care about good or bad news. The tracked twitter accounts are normal people. The whole project is just a means to push fake stories about alleged "Russian influence" into U.S. media. Whenever some issue creeps up on its dashboard that somehow fits its false "Russian bots" and "divisiveness" narrative the Alliance for Securing Democracy contacts the media to spread its poison. The U.S. media, - CNN, Wired, the New York Times - are by now obviously devoid of thinking journalists and fact checkers. They simple re-package the venom and spread it to the public. How long will it take until people die from it? The more I tried to read moon, the more convinced I became that this is a Russian bot site. Sad. Have to chime in on this one, there are companies perhaps an entire industry in Russia for 15 years or so which is 'hackers for hire' many of them are not Russians but have fled there due to Russias poor law enforcement and the lack of any type of digital law enforcement in that region (not only in Russia but Kaz and the stans too). 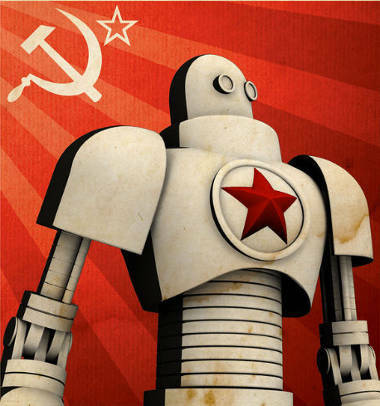 That means anyone with a few bucks can hire a Russian group such as a bot army - such as a political candidate or their campaign, in order to get results like social media response. Not saying Trump hired a Russian bot army just stating what everyone seems to miss and that is that many of these 'attacks' and other mischief that comes from Russia it's because Russia is the hacker capital of the world because it's so hard to enforce law there especially on foreigners who Russia cares little about. For example you can find on russian sites just about any Hollywood movie in HD and music, books, etc. The Russian government likely engages in limited cyber operations likely mostly as defensive measures. The other added benefit for criminals to hire russian hack groups is the obvious scapegoat element.